It’s finally time to share some of the details of our budget bathroom redesign! 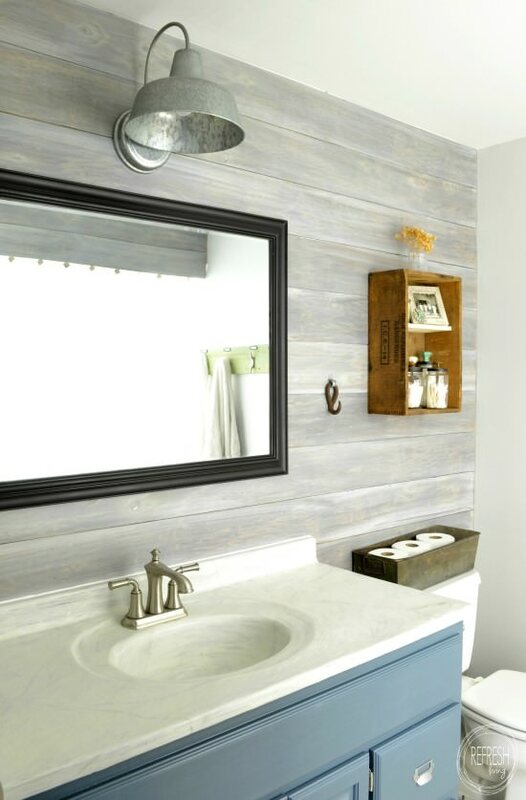 This DIY plank wall was easy to create and install, budget friendly, and made a drastic change in the space. If you love the whitewashed look, you should check out this tutorial, as it gives what I’ve found to be the perfect whitewashing technique. 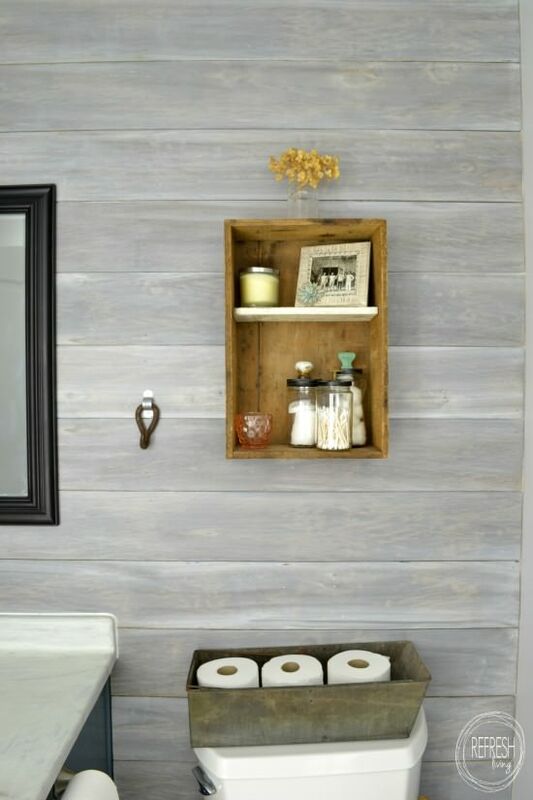 If you prefer a stained wood wall, or a painted white plank wall, this tutorial will still work for you, you would just stain or paint the wood before installing it. To keep the cost down, I used 1/4″ plywood for my plank wall. It was by far the cheapest option, but still created the look I was envisioning. 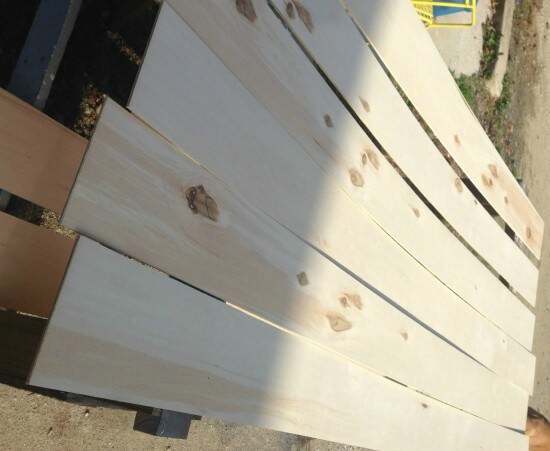 If you are planning to stain or whitewash the wood, you’ll want to get a higher grade of plywood. I used birch because I loved the knots on one side of the wood. If you are just painting it, any sanded plywood should work just fine. I would just be sure to prime it before painting. I ended up needing two 8′ by 4′ panels of 1/4″ plywood. My wall measured less than 8′, but if it was longer, I would probably just stagger the seams between boards in a random way. I had an employee at the hardware store rip down the boards, but this store had a new policy that they could only rip them down to a minimum of 12″. I stood envious as it took less than a couple minutes to rip down the boards, knowing it would take me ten times as long to make the last cut of each of those boards. So, I went home with 8 boards, and used my table saw to rip each of those boards in half. It was at this point that I stained and whitewashed the boards. I had to measure, cut and install each board at a time, because I haven’t met a wall in my house that was level and the same measurement at the top as it is at the bottom. I air-nailed into each of the studs, and that was about it! I love how it turned out. You can see how I put together all the elements of the room, and how the entire room refresh only cost me $200! What color did you take? Beautiful! I would love to do that to a wall in our house. 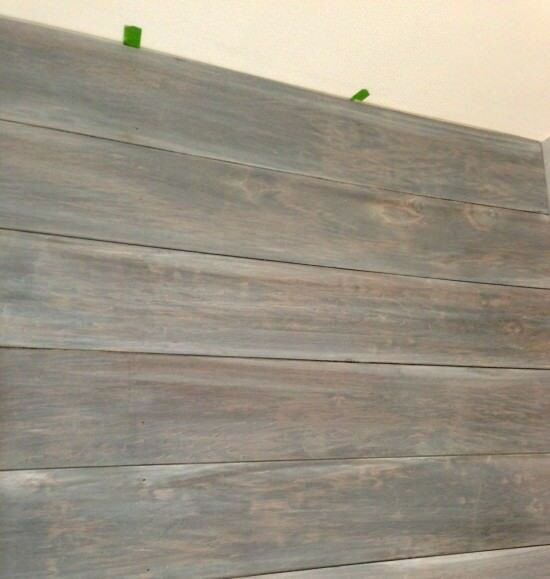 The gray and white look of the whitewashed planks would be perfect! Oh thanks so much! I was a little worried the gray would make the room look darker than I wanted, but I think it works with the other light elements. I love the wall!! I’ve been looking for a way to cover the former owner’s terrible paint job and rough walls In my bathroom. This is it! 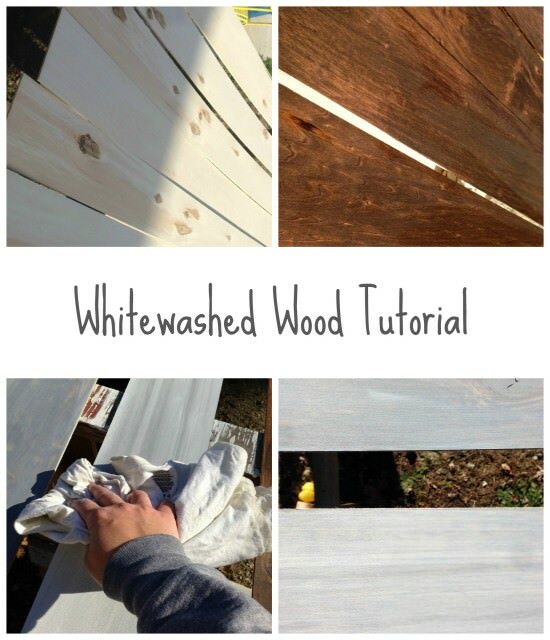 Thank you for sharing and the easy whitewashing instructions! I’m so glad it was helpful. Good luck on your wall! Oh my goodness! I want to do this to our boys’ bathroom! Such an awesome look! Thanks so much for sharing your creativity at The DIY Collective this week! Please come back next week to show off your latest project! Thanks Ashley! It’s an easy update – you should add one to your boys’ bathroom! I love this look! It’s taking us forever to remodel our bathroom, but something like this would look great in there. Pinning this. Great! Plus, it really didn’t take too much time. Thanks for pinning!! Just Wow! It looks really great! I love the blue vanity and that light as well. Thank you so much for sharing at the Create – Share – Inspire link party. I hope that you will be by again this evening. Thanks! Wow! pretty impressive that it is actually plywood! I never would have guessed! With it cut into strips and the grain, it is very believable looking planks. Well done! I absolutely LOVE this! I’ve chosen it as my favorite link from Link Party Palooza, and we are going to feature it on all of our sites this Friday! Thanks for linking up! I’m so glad you like it, Stephanie! I’m so excited to be featured this Friday! 🙂 Thank you!! Hi Anne – Everything you should need to know about how I got to the color I did for the wall is in this post: https://refreshliving.us/2016/01/the-best-way-to-whitewash-wood.html Let me know if you have any questions! It looks great! How did you get the horizontal spacing between the planks? Hi! Thanks for your question. 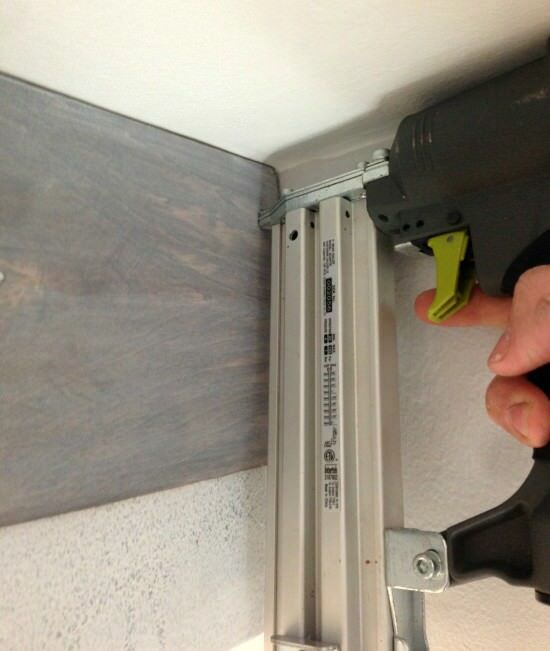 I used a quarter and put it in between the boards before I nailed the next board in. I will admit, sometimes I just eyeball too, though and it seems to work!